We love cruise ships here at Cruise Hive and always looking for the best views, this footage is right up there when it comes to cruise ship views. 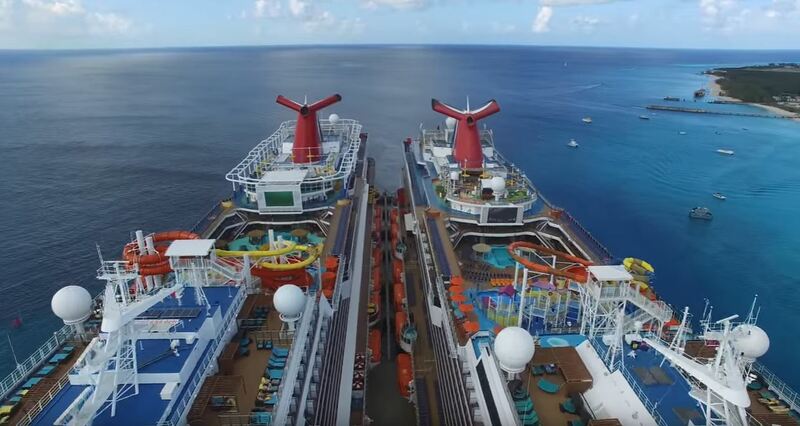 Adam Zweimiller captured stunning views fo the Carnival Magic and Carnival Vista as they were both docked next to each other in Grand Turk. Using a drone, the two ships looked totally stunning with the Caribbean island to go along. The footage was done on December 22, 2016, Carnival Magic was on calling at the island as part of 7-night Eastern Caribbean sailing from Port Canaveral, Florida. Carnival Vista called in Grand Turk while on a cruise from Port Miami, Florida. Carnival Magic is a 128,000 gross ton vessel which can carry over 3,800 guests. The ship was recently refurbished in 2016 in the Bahamas and is the second Dream class ship. Carnival Vista is the largest and newest ship in the fleet at 133,500 gross tons and carrying over 3,900 passengers. Carnival Vista entered service in May 2016 and another sister ship named the Carnival Horizon is coming in early 2018.